Every parent expects the occasional sleepless night, but when is it a sleeping problem that needs fixing? Life with kids can be tough. Sleepless nights can leave you feeling exhausted and frustrated, especially if a lack of sleep is a regular occurrence and other children seem to be sleeping through all the time. A lack of sleep can even start to affect your mental health. When you have young kids some sleepless nights are to be expected, but how do you know when you’ve got something that needs fixing? If your child is struggling with sleeping problems, you’re not alone – research suggests approximately one quarter of children will experience a sleeping problem at some stage during their childhood. Read on to find out about children’s sleep patterns, common sleep problems and ways to manage and treat them. What’s normal when it comes to children’s sleep? Just like adults, every child is different when it comes to how much sleep they need. An Australian study that examined the sleeping patterns of more than 10,000 children aged from birth to 9 years old found a striking range in the number of hours children sleep, particularly for younger children. Children aged 4 – 6 months slept between 10 and 18 hours each day, with the average falling around 14 hours. This gradually decreases as children get older, with the average falling to around 10 hours when children reach 9 years of age. MORE: What happens during each stage of sleep? If your child is getting a lot less sleep than most other children their age, you might feel concerned. But according to the Royal Australasian College of General Practitioners (RACGP), if they appear to be happy and thriving, there’s no need to worry. Your child is having difficulty at school, including trouble concentrating. Sleep problems can stem from a medical issue, or can be behavioural in nature. Behavioural sleep problems are the most common type of sleep problems in school-aged children. These problems include not going to bed, not settling to sleep, not staying in their own bed and waking up too early in the morning. According to the RACGP, many sleep problems arise when children become accustomed to going to sleep a certain way, for example, being rocked or fed to sleep. When they wake up, they expect to go back to sleep the same way and may not be able to settle themselves without a parent. It’s not uncommon for these problems to come on after a holiday, or an illness. Establish a strict bed time: Set a time and stick to it. If your child has been having trouble falling asleep or going to bed, it’s likely to get worse for a little bit before it gets better. Stick to a bedtime routine: Try to have 30-60 minutes of quiet time before bed. You can include things like a bath, pyjamas, cleaning teeth, toilet, a bedtime story, kiss goodnight and lights out. Try not to let your child stall. Ensure good sleep hygiene: Keep the bedroom dark and quiet, avoid screen time for at least an hour before bed, avoid caffeine in the afternoon and wake-up them up at the same time each morning. Teach children to fall asleep without you: Once you’ve established a bedtime routine and good sleep hygiene, it’s time to teach your child to fall asleep without you. There are several methods you can try, including controlled comforting and camping out. Your GP can provide advice and support and refer you to a sleep school or specialist if your child is still having problems. 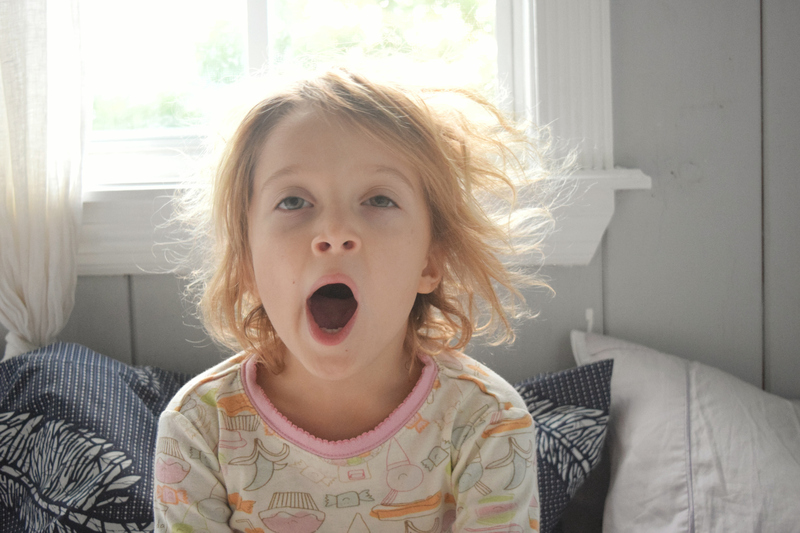 Another relatively common sleep problem in children is obstructive sleep apnoea. Obstructive sleep apnoea occurs when enlarged tonsils in the back of the throat or adenoids in the back of the nose partially or fully block airways during sleep, and make it difficult to breathe. Signs you child has sleep apnoea include loud snoring, pauses in breathing or difficulty breathing when sleeping. Treatment usually involves surgery to remove the tonsils or adenoids, and is successful in 80-90 per cent of children. If you suspect your child has obstructive sleep apnoea, see your GP. MORE: Does your child suffer from sleep apnoea? Some children might not be able to fall asleep, or may not be able to get back to sleep because they are feeling anxious. Most of us can relate to being afraid of the dark as children! A certain level of anxiety is normal, and most children learn to deal with their fears as they get older. But in the meantime, simple things like a dim night light, blanket or teddy can help. The RACGP suggests asking your child to write down or talk about their worries before bed or teaching them relaxation techniques. However, if your child seems to be experiencing more severe anxiety, it’s important to see your GP or a mental health specialist. If you think your child is experiencing a sleep problem, the best place to start is with your GP, who can provide advice and guidance based on your specific situation, and check in on your progress. If sleep problems persist, your doctor may refer you to a sleep specialist or school for diagnosis and treatment. Don’t forget to look after yourself as much as possible. If you’re not getting enough sleep, it’s even more important to eat healthy, exercise, find time to do things you enjoy and talk to someone if you’re struggling. Dealing with sleep problems can be difficult and exhausting, but try not to despair. With some help, they generally improve, meaning the whole family can get some well-earned shut-eye again.